The OptiSonde humidity indicator from GE Sensing & Inspection Technologies is a transmitter and data logger that can also be used to calibrate and verify a variety of humidity sensors and instruments. It is designed for documenting the environmental conditions of process and storage areas. The OptiSonde directly measures dew point temperature by using an infrared light emitter and detector to regulate heat being removed from a precious metal mirror, regulating a condensed dew or frost layer to a constant mass. The temperature of the mirror is measured by a resistance-temperature detector. 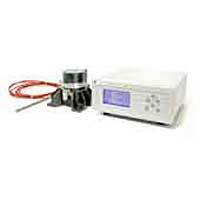 The analyzer is available in bench-top and wall mounted configurations. For room monitoring, the chilled mirror and temperature sensor is plugged directly onto the chassis, or the sensors can be installed up to 300 feet away and connected via cable. In addition to the LCD readout, data is transmitted via two fully scaleable analog signals (4-20mA) and digitally via an RS-232 port. The data may also be exported as an ASCII text file format for use in spreadsheets.